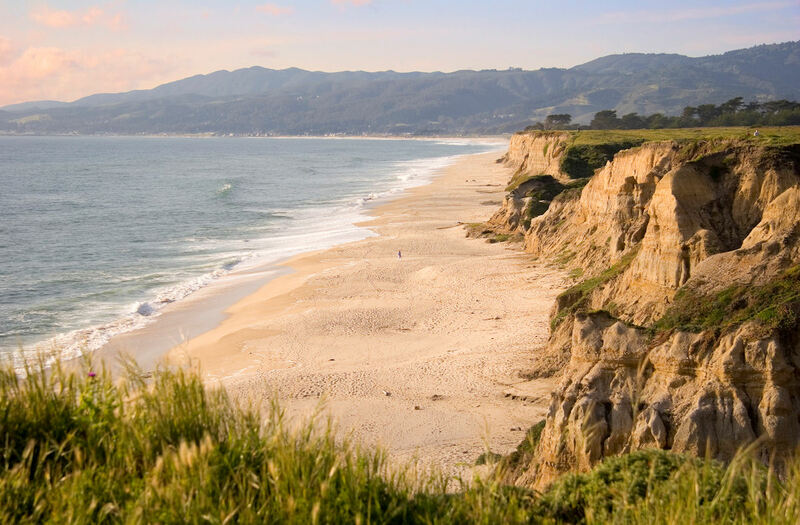 The Half Moon Bay coastside offers a surprising number of hiking opportunities. 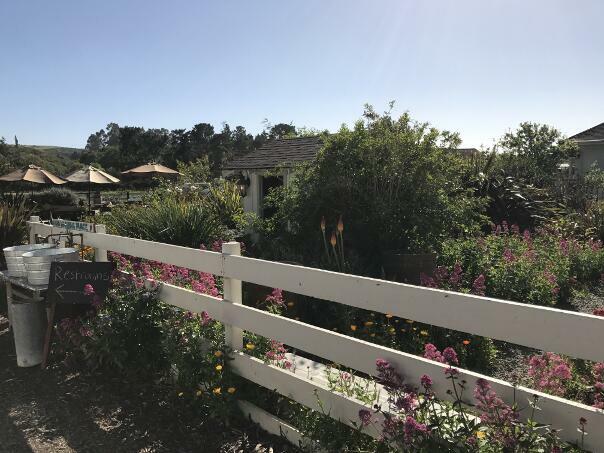 From easy paved walks with almost no elevation change to Montara’s impressive peak towering almost 2,000 feet above the sea, there is a trail for hikers of every ability level. While the longest and highest trails always piqued my interest growing up in this area, years of exploration have lead me to deep appreciation for some of the shorter trails tucked away in the quieter corners of our community. One of these hidden gems is located just a few miles south of Half Moon Bay proper. Cowell Ranch beach and access trail is a quiet escape. An easy half-mile path leads visitors from an ample parking lot directly to a beautiful beach. After descending the steps to Cowell Ranch beach, yellow sandstone cliffs tower above beach goers and offer the sensation of near-isolation. Cut off from the noise of highway-1 traffic and out of view of any buildings, one almost feels transported to a place with no people at all. This is an easy walk with ample free parking, but for those looking to venture further, the trail system extends south along the clifftops and connects to another trailhead, the Cowell-Purisima trail head, just over 2 miles away. Just beyond that trailhead and parking lot is Seal Rock (not to be confused with the Seal Rocks of San Francisco). Lucky visitors may catch a glimpse of the famous harbor seals, the rock’s namesake. The wonderful thing about this trail system is its versatility. It offers an easy path to the beach with convenient parking and a longer adventure for those who’d like to see more of this quiet stretch of coast. With two trailheads and parking lots, there’s even the possibility for a one-way 2.5 mile hike from the Cowell Ranch beach access parking lot to the Cowell-Purisima parking lot, provided hikers make the proper arrangements for drop-off and pickup. As a guide at Half Moon Bay Coastside Tours, I’m excited and honored by the opportunity to share this sliver of tranquility just south of our town. After all, the best adventures are those taken in good company. Thanks for reading and we'll see you here on the coast! In this awesome evening of activities, we infused a little bit of friendly competition between coworkers to inspire a learning spree about the rich history of our coastside community. Afterwards, we celebrated with some wine tasting and mingling over a delicious spread of Italian snacks and Spanish tapas. The scavenger hunt is a wonderful way to get people working together creatively! Our group arrived just a touch late to beginning of the session, so with little fanfare we quickly counted off and created random teams. I assigned arbitrary members the role of "team captain," with little explanation of the actual responsibilities of this title. Most of the members of this corporate group knew each other fairly well, but some worked in different areas. One of the best parts of this activity is it provides the perfect opportunity to build connections across the office where day-to-day work doesn't foster such connections. With a quick explanation of the rules, the scavenger hunt boundaries, and a hint at the prize, the teams were off. Well, most were. A few clever groups decided to stick around and prod the judges with tricky questions. While this was not strictly forbidden by the rules, they would find little help from the guides. As the groups were out hunting away, we set up the wine tasting and snacks at our local winery, Barterra. A little more than an hour later, the first groups started to trickle in. I don't want to reveal too much about the substance of our scavenger hunt, as internet searches are allowed by the official rules. However, I will say that all of the groups came back with an impressive array of answers, photographs, and creative solutions. As always, the teams that were best able to organize and delegate to the strengths of their members did the best. The winning group took the prize with an impressive sweep, getting all but a couple of the correct answers. They were rewarded with a bottle of sparling wine and a celebratory toast! As the judges were busy calculating the final scores, our own Mary Corcoran began the wine tasting session. Her enthusiasm and background in the industry make her an excellent sommelier for this event. After announcing the winners, and celebrating with a toast, the entire group had a chance to taste some of the great wines offered by Barterra. The winery even generously offered a discount to anybody purchasing wine! This experience was short but sweet. With such a large group, it can be difficult to find a way to encourage bridge building in the limited time we have to work with them. In our experience, a bottle of wine, a little competition, and some quirky local history provide the perfect environment for team building. And what better way to debrief than over some excellent wines, cheese, and traditional Spanish tortilla? My favorite thing about this group was learning about the fascinating work they do and meeting the awesome individuals I had a chance to talk to after the scavenger hunt. All brought just the right amount competitiveness and playfulness to make the evening as much fun as it was. At the end of the evening, we said our goodbyes as the group boarded their shuttle (an excellent choice after rigorous wine tasting) and headed to Mezza Luna for a fantastic Italian meal on the coastside. Thanks for reading and I'll see you here on the sunny coastside soon! The best part of my job is being able to share this amazing place that I call home with our visitors! This tour started on a sunny Saturday morning at the Ritz Carlton of Half Moon Bay. Our guests were a lovely couple visiting from Pennsylvania. Luckily they were happy to heed our advice of starting this one early, as parking at the nearby redwoods park fills up fast! We arrived at the coastal redwoods in less than ten minutes after leaving the Ritz. "The redwoods are so close by!" commented the wife as we claimed the best parking spot. The early morning sun cast a golden hue on the flora still sparkling with morning dew. Purisima Creek sounded almost like a river rushing by the car; this is the end of a record rainfall winter, after all. The three of us took a moment to take in the tranquility of the place before setting out on our hike. We were struck with a profound sense of solitude, being the first to arrive at the park that morning. Away from the sounds of traffic and voices, we had been transported to another world. From the road we could see a few redwood trees, but the true scale of these amazing centuries-old organisms does not become apparent until you actually stand right next to the tree trunk. Once again I reveled in the joy of showing these trees to somebody who's never seen them before. This is an excellent photo opportunity. A photo of yourself standing miniaturized next to the biggest trees on earth is the best way to share their size with friends and family. We stopped at the first trees for several minutes taking photos before moving on. “So, what kinds of animals live here?” asked the husband. I mentioned the shy animals that are hard to spot, including mountain lions, bobcats, coyotes, and the occasional black bear. “We probably won’t see any of those up here. 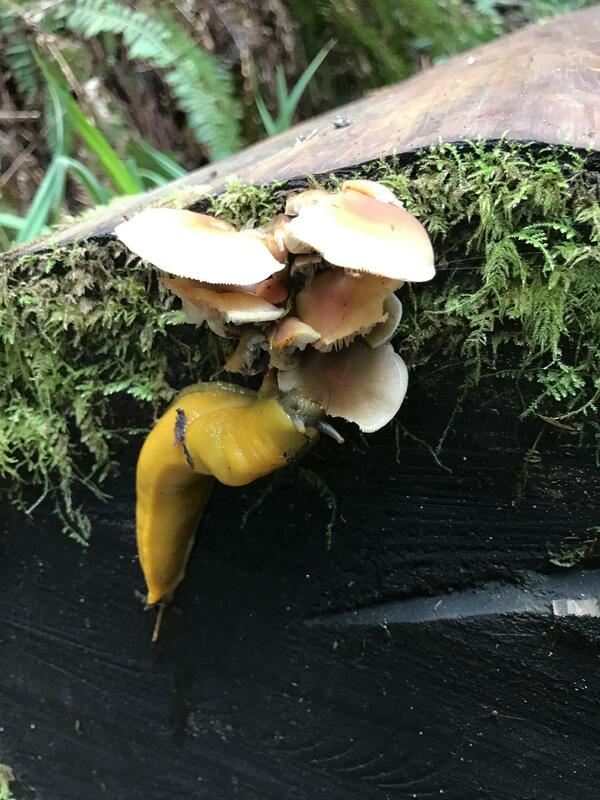 Banana slugs, however, are almost a guaranteed sighting!” I answered. “What’s a banana slug?” asked the wife. She had never heard of these animals before. Standing in the redwoods on a wet morning, I was sure I could show her right away. I looked off the side of the trail, saw a telltale yellow band, and pointed at it. The slug was a small adult, about 3 inches long and still brightly yellow colored. After spotting the first, we looked around and realized we were completely surrounded by the animals. With all the rain, they’d had an enormously successful reproductive cycle. Baby slugs and adults mingled all around us. The visitors observed the animals with the usual curious combination of wonder and disgust. The redwood forest is a place of absolutes, home to the biggest trees on Earth, the (cousins of) the biggest slugs alive today, and featuring some of the oldest species found on our planet. And on this quiet morning, with the golden sun turning green as it filtered through the redwood canopy, we all felt as if we were in the most beautiful place on Earth. This group was interested in checking out the south coast as well, the area south of Half Moon Bay closer to the historic community of Pescadero. However, they had not decided what to do yet. We gave them some options and left it up to them. I absolutely LOVE flexible tours like this. The freedom to follow whims makes the tour just that much more personal. During our redwoods hike, we discussed options. The couple had been disappointed when they went looking for marine mammals at the Fitzgerald Marine Reserve to no avail. I told them about Año Nuevo, the marine mammal pupping site that provides a similar almost-guarantee of spotting the animals in question. “It’s a bit of a hike,” I warned. That was no problem for them. We opted to head south towards Año Nuevo. On our way out of the redwoods, the crowds had arrived. The laughter of children running and the chatter of friends on vacation permeated the once-tranquil parking lot. We surrendered our spot and headed south. The drive from Half Moon Bay past Pescadero to Año Nuevo along highway 1 is an amazing one. The sheer cliffs of San Gregorio State Beach behind the artichoke fields provide vista unique to our section of coastline. We arrived to Año Nuevo and hiked out. We learned the elephant seals were molting, meaning they were shedding their winter layers of skin. This looks kind of like the animals are suffering some sort of horrible skin disorder. The docents informed us that this is perfectly normal and healthy. Elephant seals are very big, impressively so. We did not see any adult males, the very biggest of the species. They do not molt with the females and juveniles. Still, we were not disappointed. The beach was littered with mothers and pups, lounging about and throwing sand over themselves. By the time we got back to the car, we were quite hungry. We headed to downtown Pescadero for a quick lunch. We stopped at Arcangeli, a bakery and deli on the main strip in Pescadero. The downtown was packed. We struggled to find parking and encountered a huge line at the deli. I had never seen the town so crowded, but so it goes on this coastside. It seems we have more and more visitors every month. And it’s a good thing! These communities rely heavily on tourism for their livelihood. We grabbed some sandwiches and some fresh-baked chocolate chip scones and chowed down. With no patience for waiting, hunger gnawing at our bellies, we stood outside the deli and ate. The food, especially the fresh baked goods, was awesome (as usual). We had a lot of fun on this tour, and I really appreciate groups like this that are flexible and just want to have a good time. I feel so lucky to be able to share my beautiful home with wonderful people like this. This was incredible. I went into the experience with high expectations and they were blown away. We arrived at 5:00 in the afternoon when the sunlight was just beginning to take a golden hue as the sun made its way towards the ocean. I had visited the farm before, and as usual the place demanded from me a serene moment of reflection upon arrival. We looked at some of the baby goats in the baby goat pen and admired the impressive flower garden. 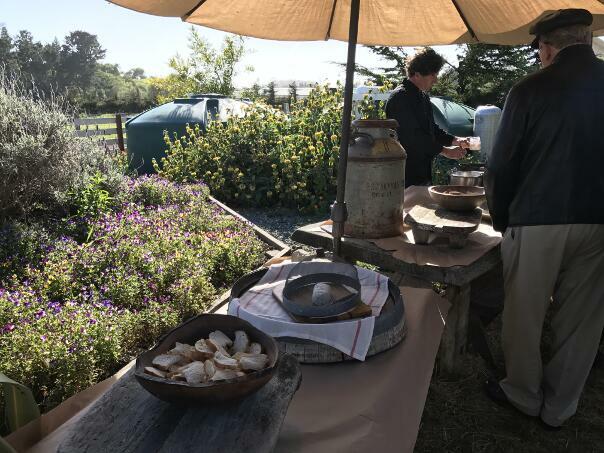 Some familiar faces arrived and together we entered the garden to graze on some fantastic cheeses and sip refreshing lemonade. We mingled a bit as the tour was prepared for us. I wandered over to the elegant spread of simple fresh goat cheeses for a taste. On the table were three cheeses, a lavender cheese, a flower cheese adorned with a brightly colored set of flower petals, and a chive cheese. Seeing the same colors of flowers growing all around us, I asked the gentleman serving lemonade if the flowers used in the cheese were sourced from the farm. “Oh, yeah. The lavender came from this plant.” He gestured to a plant literally within reach, just over his right shoulder. “The colorful petals are for decoration, but they’re edible, too,” he explained. They also came from that very same beautiful garden. The murmur of conversation died down as Deborah “Dee” Harley stepped into the crowd and introduced herself. She welcomed us, thanked us for coming, and began to field our group’s seemingly endless supply of tricky goat questions. Eventually, she urged us to bring our questions along and led us to a goat pen. We walked between several different baby goat pens as we learned about what the goats were doing as they grow. Soon, we were walking amongst the adult goats, some of whom had just given birth the day before. We were given a due warning about our clothing. “They will like to nibble on your clothes. They’re just playing,” explained Dee. As we walked along, a sharp tug on my shirt tail prompted me to turn around. 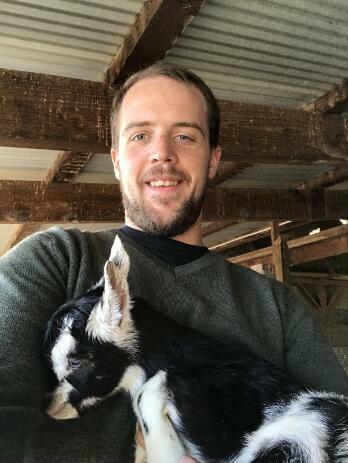 Sure enough, there was a goat right behind me, “playing” with my shirt. 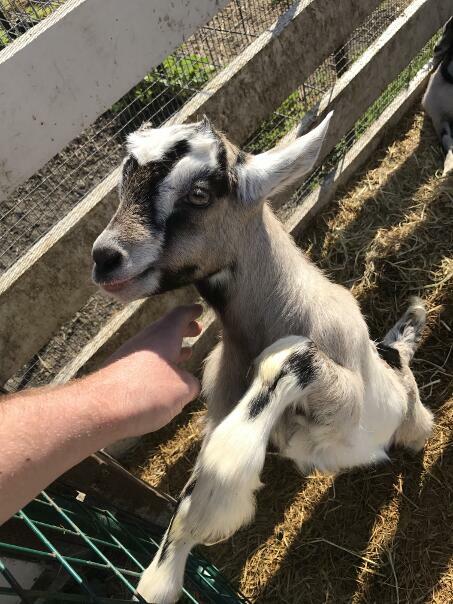 Then we got to the cutest baby goat pen of them all. “These goats were born yesterday,” announced Dee. She picked one of the four little guys up and thrust him into the unexpecting arms of a visitor. She casually proceeded to distribute the rest of the goats to the rest of us. People were hesitant at first, as even the week-old goats seemed a little bit too energetic to hold. Yet these animals, being so young, were perfect angels in the arms of the farm guests, sweet and endearing as could be. We had our “aw” moments with the goats before moving on. I watched Dee wrangle the babies back in and get all the adult goats sorted out as she urged our tour group to move forward. In that instant I realized Dee had the difficult task of herding multiple generations of goats, and a big group of humans, all at the same time. 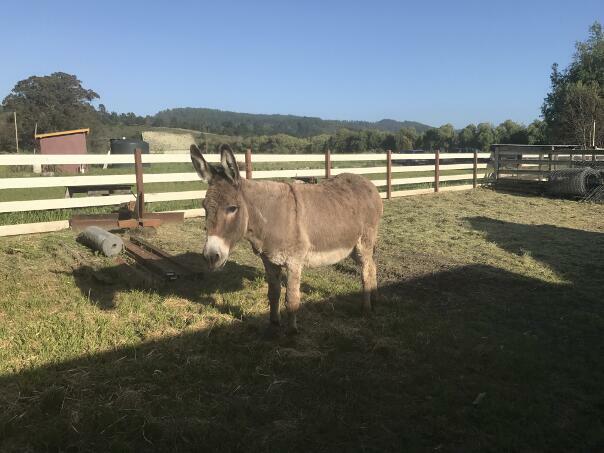 I admired her competency as we continued through the goat “maternity ward” and out into the back, where we met Rosie the burro. We washed our hands and entered the milking parlor. Dee explained that this was the same room she hand milked her first six goats back when her farm started. 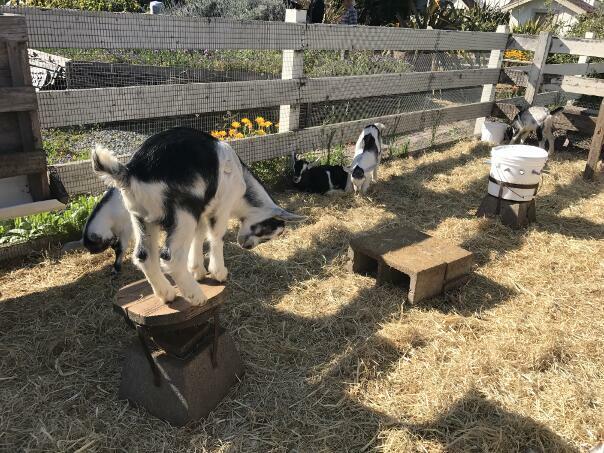 Each piece of the room was added with a purpose, until they ended up with what they have today: a row of milking machines, a ramp and a platform for ergonomic access to the milking goats, and an efficient system for milking all the animals. She was particularly proud of her milk collecting vessel, a glass tank that is apparently hard to find on modern dairy farms. Seeing the milk fill the tank, she said, is one of the simple things that make her job worthwhile. We continued into the cheese shop where we learned more about the multitude of products made there on site at the farm. The dairy products include chocolate truffles, soaps and even a goat milk paint they used to paint some of the interior of the shop. Also produced on site is a honey (used in the honey and lavender infused cheese) and a number of other products. And then we entered the cheese making room. We saw how the milk is piped in from the milking room and processed. The milk is pasteurized and curdled overnight, and the next day curds are separated from the whey. The process from milk to cheese is amazingly fast, a matter of just a few days. Dee reminded us that they produce fresh, not aged, goat cheese. This cheese is meant to be enjoyed immediately after being made. And, in that spirit, she presented us with four different cheeses to taste. We tasted the ricotta, chevre, fromage blanc and feta cheeses while learning about the different processes involved in making each. These four styles of cheese are the four Harley Farms produces, focusing on simplicity and quality. The strategy seems to work, as the small farm holds many awards for its cheeses – some international. Dee describes a “warm, fuzzy” feeling she gets from knowing that her cheese beat a French goat cheese in an international competition. Thoroughly enchanted by the tour, we went upstairs to the dining room as the sun was setting to the west. 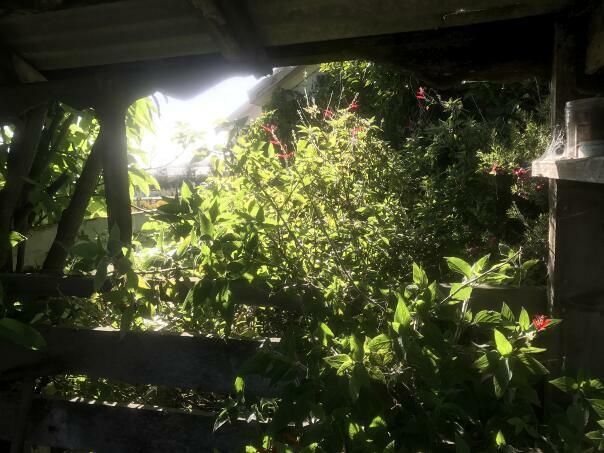 The sunlight filtering through the garden surrounded us with a beauty beyond description. We arranged ourselves around a magnificent wooden table, fashioned from a cut of a giant tree that had fallen into the creek years ago. Each piece of furniture in that building had a personal touch and a tie to the community, as well as the building itself. It was a part of the original (cow) dairy farm that opened on that site in 1910. Giving that building, which had been in disuse when Dee found it, new life and purpose was very important to Dee. It started with an amazing mushroom and sausage soup with Harley Farms feta on top. 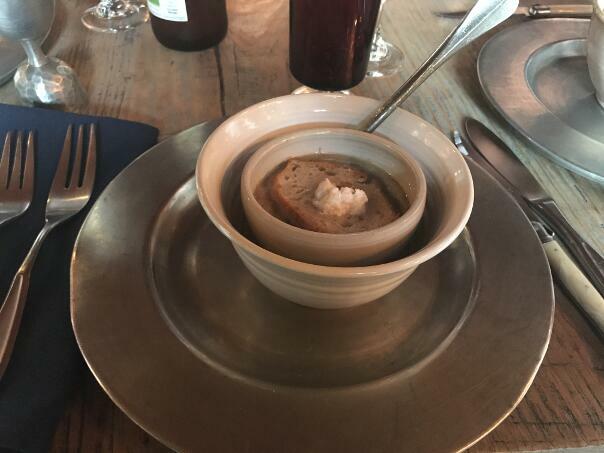 The soup was smoky and rich, and upon the very first taste I knew we were in for an exceptional culinary experience. 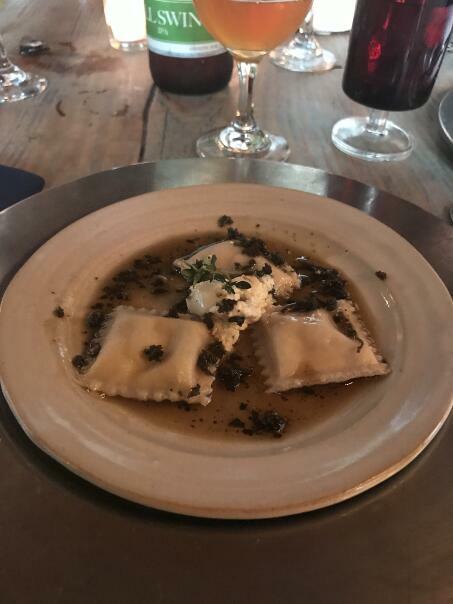 The second course was a goat ricotta-stuffed ravioli plate with a garlic-infused fromage blanc in the center, dowsed with fried sage leaves and melted brown butter. This sounded, looked, and smelled amazing, but biting into this dish was extraordinary. The slight crunch of the fried sage leaves pulled the textures together, and the flavors of the fresh cheeses and pasta were stunning. And then then main course arrived. 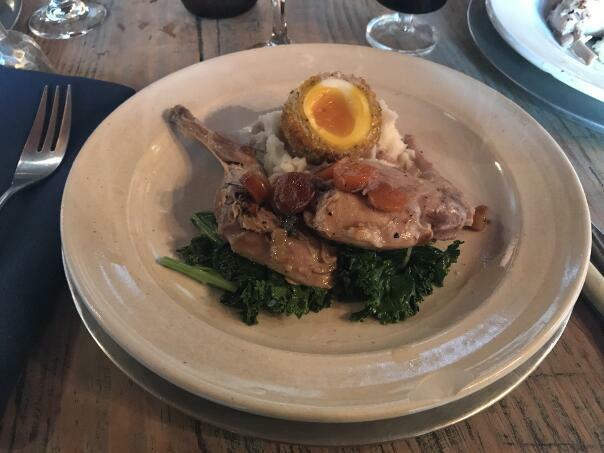 I felt humbled as I was presented with a leg of rabbit on a bed of potatoes with a scotch egg and a side of fresh kale. The chef himself presented the course with a description of the food and its sources. The egg and rabbit were from the farm itself, while the kale was from a local producer. I had never enjoyed a scotch egg, nor had some of my fellow dining guests. We speculated over how one would go about getting a soft boiled egg into a ball of sausage and then frying the whole thing. Everything was done perfectly, and every bite was rich. We were all quite satisfied with our meal. Ten minutes later, dessert arrived with coffee. 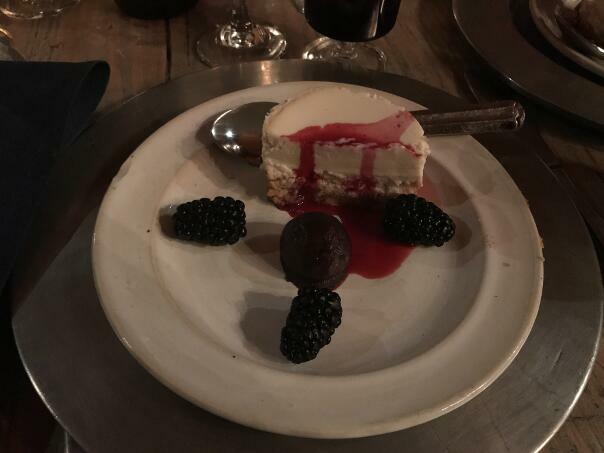 We were amazed once again as goat cheese cake, goat chocolate truffles and berries were served. The cheese cake was loose and fluffy with tangy notes. It was very rich, unique (admitt edly the first goat cheese cake I’ve tried), and absolutely delicious. The chocolate truffle melted in my mouth. I am no food critic, nor am I hard to impress when it comes to food. That being said, this meal was truly unmatched by any dining experience I’ve ever had. It wasn’t overly ambitious or fancy, but it delivered its simple message with expert execution. Reflecting on the entire experience, every single piece was elegantly placed and executed with the same simple standard of quality that makes this little dairy farm so exceptional. The atmosphere is vibrant and vital, and the farm exudes an energy of its own. These elements and the coastal air, explained Dee, give her cheese the unique flavor it is famous for. Our tour guides set us apart. Join a group tour or your own private tour - in either case, our guides are from the local area and have a wealth of knowledge about what to see and Coastside history. This is Michael Klear- he's an astrophysics graduate studying data science. 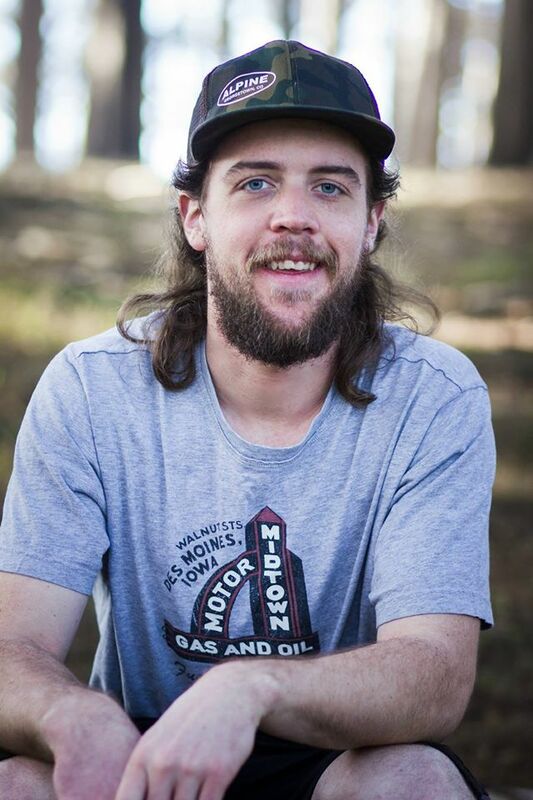 He grew up on the coast and his passions include skiing, craft beer, running, and backpacking. An Eagle scout, Michael is very knowledgeable about the natural science of the area and specializes in outdoor activities.